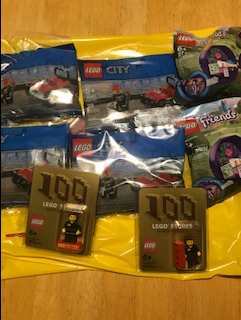 I got two of these yesterday when the promo started, and I thought instead of throwing them up on ebay, I'd post them here first so a fellow Bricksetter could enjoy them. Since they're going for $45-$60 on ebay (crazy, I know), I thought I'd undercut their prices a bit. I'm only looking for $35-$45 for each (including shipping). So if you're in the market for one, PM me an offer. Also forgot to say, the other poly bags in the picture are available for sale/trade as well. While I have now sold the two I have, if anyone is still interested I could go back and get another. But the promo ends soon so contact me quickly if you are considering getting one. Since @starwars4ever sold out. I’ll also part with mine for $35 shipped domestically if anyone else is interested.